Searching for a job will require your resume to get past the applicant tracking systems (ATS). The ATS is resume screening robots programmed with criteria keywords the hiring company or recruiter are seeking in a job candidate. Incorporating the correct keywords, phrases, terminology in your resume, cover letter, and LinkedIn profile is critical to a successful job search. 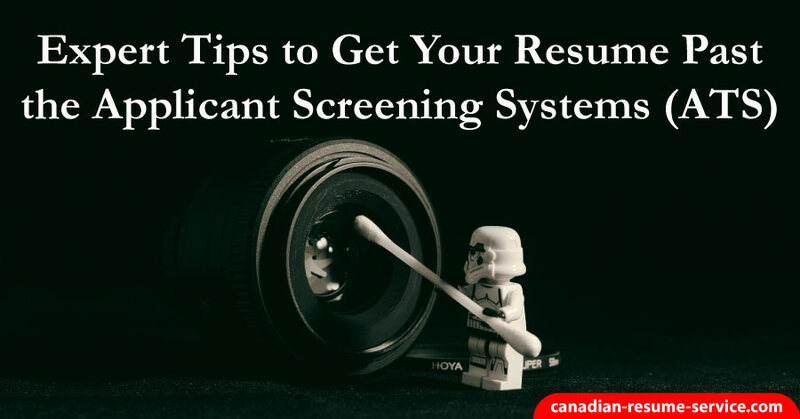 In many of the posts on my website, Canadian Resume Writing Service, I mention this vital job searching advice over and over again. I don’t mean to sound like a broken record or bore you, but that is just how important this information is to your job search success. I want to make sure you 100% understand the importance of including the right keywords in your resume and cover letter to secure job interviews for the positions you desire. If you are failing to secure job interviews, the roadblock may not be a lack of skills, experience, or qualifications. It could be your resume and cover letter are not beating the online bots. In other words, this means your job search documents could be missing the correct words and phrases to describe your expertise and the value you can bring to a company or organization. In the age of online applications, this failure can be the single biggest deterrent to your job search. Companies are relying on candidates to use the right keywords in their resume and cover letter. Many organizations and companies are using applicant tracking systems to help them sort through the many job applications they get from their online job postings. Hiring screening software is programmed to streamline hiring by sorting through applications and only keeping those that contain the right keywords that companies are looking for in a job candidate. So, in order to ensure your resume gets read by a human, you need to make sure that your resume is properly targeted with the correct keywords highlighted. Most people do not know this, but the application procedure is much more complex and goes far beyond the online application page the candidate is seeing. After filling out the form and uploading your resume, the process is taken over by special software designed to filter out irrelevant and unqualified resumes. Buzzwords or keywords are the primary determining factor as to which resumes will reach the next stage of the hiring process and what resumes will land in the black hole. Knowing where and how to use these keywords will also determine which resumes are pushed up the pile. All of this is done automatically by the software, even before a human sees any of the resumes. If, after doing your initial research to identify keywords you end up with a list of 50 words, don’t be tempted to try and shoehorn them all in. This strategy can easily backfire and it’s unlikely to impress the company’s hiring committee. When writing your resume to beat the applicant tracking systems (ATS), be selective about the terms and phrases you include – your resume should read naturally while adding the group of keywords that are most important. Use descriptive keywords when describing your past work experiences and accomplishments. Start your phrases in the past tense, listing them in bulleted format. This method will make your statements dramatic and descriptive. Example descriptive words include: achieved, decreased, planned, produced, restructured, transformed, initiated, supervised, and managed. Showcase your competence in a particular field by using the correct keywords that highlight your competencies and expertise. Examples of industry keywords include computer skills, sales plans, marketing campaigns, personnel management, employee hiring and training, human resources, teamwork environments, event coordination, professional presentations, directional drilling, client relationships, productivity increases, contract negotiations, report writing, data-driven analysis. Examples of keywords to use in an executive resume could include strategic business planning and execution, complex change management, fiscal accountability, acquisitions, mergers, client relationship management, global markets, financial planning & analysis, strategic partnerships, internal controls, growth initiatives, and the list goes on. A few examples of keywords to use in an oilfield consultant resume could include safety & regulation compliance, project management, preventative management, quality control management, vertical, directional, and horizontal drilling, production planning, process redesign, resource allocation & administration. As you know, there are many job titles in the oil and gas field, as with any industry, so make sure the keywords you incorporate into your resume coincide with your skills set and the position you are seeking. As you know, seeking a new job position can be a challenge – the competition will be quite serious and you will be expected to be at your best to secure the job. The applicant tracking systems (ATS) software will scrutinize your resume and determine if it is well written enough to earn you an interview. For this reason, many savvy job seekers hire my resume writing services, as a professional resume writer I have in-depth experience on how to properly place the right keywords in your resume and cover letter. Note that this software not only recommends you to one company, it also puts your resume in front of different hiring professionals at the same time, giving you leverage of choosing. This is excellent because you only need to put in your effort once and the rest is taken care of for you. All you need to do is write a powerful resume with the right keywords included and place the document in strategic places like your social networking sites, blogs, websites, job search engines, online job boards, etc. The idea is to get your resume into the right venues so that when companies do a random search for your target position, the applicant tracking systems (ATS) software will pick out your name, even in your absence. Include relevant associations or professional groups you belong to in your resume. Highlight your keywords when possible, including keywords near the beginning. Search engines easily pick phrases at the beginning of a document. Use the hashtag option on social networking sites. When using acronyms, spell out the full titles as well as the abbreviated form. Same keyword placement tips apply when writing your cover letter – always send a cover letter with keywords. Always make sure keywords flow well, making for an interesting read. In other words, don’t make it obvious you are including keywords… it should look and sound natural. Use keywords in the resume profile and the job responsibility section of your resume. Be careful not to overuse keywords; the software could tag your resume as spam if you do. Research your industry keywords and use only those relevant to securing the job you desire. Make sure to only include keywords you are familiar with or skilled in. For instance, don’t include project coordination if this is something you’ve never done. Job searching has evolved over the years, making it critical that your resume gets passed the applicant tracking system and at the same time stands out when it reaches a human. Don’t underestimate the power of incorporating keywords in your job search documents. If you’d like to make sure your resume contains all the right keywords and will stand out from the crowd. We invite you to check out the resume writing services we offer. We’ll make sure your resume makes an excellent impression with both hiring managers and applicant tracking systems!